Berghaus + Griffin Clothing Collection – Kitmeout Designer Clothes – Fashion Blog & Fashion Forum. Leading outdoor brand Berghaus and cutting edge designer Jeff Griffin have joined forces to bring two unique performance products to YOU. Griffin has taken two key jackets from the new Berghaus collection and added distinctive and exclusive touches of his own. The Solipsist is an uncompromising, unflinching functional jacket for climbers who put themselves into the most extreme situations. When the going gets really tough, it wonâ€™t back down and it will help you to keep moving. Griffinâ€™s work is infused with inspiration from the realms of the extreme to which he is drawn. He has channelled his experiences to generate stunning design touches and a camouflage pattern that elevate the Solipsist from outstanding to iconic. The result is a jacket as desirable as it is brutal. The Guard fuses retro styling with 21st Century performance in a fully featured insulated jacket. 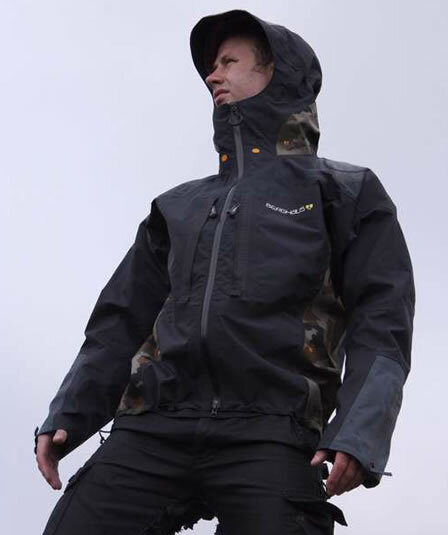 A wind proof and water resistant face fabric, zipped external and internal pockets, premium down fill and Berghaus attention to detail ensure that the Guard is a serious player. The Griffin touch ensures that while you will stay warm, you will also look uber-cool. Inspired by Berghausâ€™ North East England ship building heritage and the Angel of the North, Griffin has produced a print that celebrates heavy industry and hard work, but results in an object of apparently effortless contemporary beauty. In adapting the Solipsist and Guard, Griffin has achieved just that. Uber functional and uber cool â€“ Berghaus/Griffin is proof that they can be one and the same if you find the right combination. Reebok Trainers Reebok Sneakers Reebok Shockers!